This long-awaited new edition helps students understand and solve the complex problems that organic chemists regularly face, using a step-by-step method and approachable text. With solved and worked-through problems, the author orients discussion of each through the application of various problem-solving techniques. Teaches organic chemists structured and logical techniques to solve reaction problems and uses a unique, systematic approach. Miguel E. Alonso-Amelot is a Professor of Organic and Ecological Chemistry at the Universidad de Los Andes in Venezuela. With over 40 years of teaching experience, he has also led courses on these topics in the US, Europe, and Latin America. His previous research interests include the theory and application of metal carbenoids in cyclopropanes and heterocycles. Currently, he focuses on chemical ecology of tropical mountain ecosystems, and is a consultant on organic chemistry supporting plant natural product bioactivities. 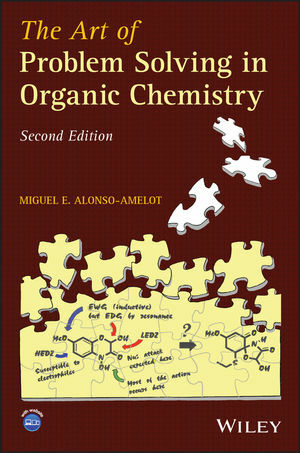 Among his publications, Dr. Alonso has written over 90 research articles, five book chapters, and four books, including the First Edition of The Art of Problem Solving in Organic Chemistry, published by Wiley.